LactiCheck™ LC-3XThree channel composition analyzer for all your testing needs! 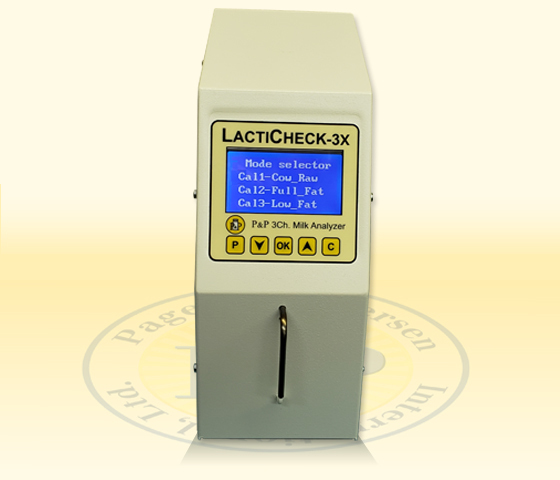 | Page & Pedersen International ltd.
LactiCheck™ LC-3XThree channel composition analyzer for all your testing needs! Three channel composition analyzer for all your testing needs! Tech Tool that Delivers Real Time Results! Testing skim milk, various processed milks (1%, 2%, whole), full fat products (coffee creamer/half & half and cream) and raw milk the LC 3X delivers accurate, reliable results in just one minute! Easy to use with no pipetting required, the instrument also features an audible ‘Time to Clean’ reminder - ensuring greater compliance with standard maintenance requirements. Easy to integrate at any point in the Plant! Compact and simple to operate, the LactiCheck 3X can easily be integrated into milk reception (raw milk), process control (skim milk and/or cream) and final quality control. This instrument can also provide composition results for cheese ‘recipes’ or yogurt formulations to ensure consistency and compliance with quality requirements. Artinsanal, Boutique and Specialty Cheese Makers: Test raw milk, cheese recipes and cream to ensure consistent quality. Optimize Fat/Protein Ratios as appropriate. Dairy Processors: Use at satellite locations like milk reception to take pressure off the central lab. Integrate into your system as a back-up to more automated composition analyzers to reduce down-time during regular maintenance, re-calibration or training on your MIR, FTIR or NIR instruments. Farmstead Processing: Confirm compliance with labeling requirements for bottled milk (skim, reduced fat, etc.) while checking correct separation functionality of cream separators. Enhance herd management for optimizing feed formulations, calf replacement formulae and herd heath. Yogurt Makers: Know that the milk coming in meets your standards. Check yogurt ‘recipes’ to ensure that the mixture is consistent so that quality is reliable.